It is always seen as a conflict when readers compare the first commandments God gave to Adam and Eve, namely, “multiply, and replenish the earth,” and “But of the tree of the knowledge of good and evil, thou shalt not eat of it: for in the day thou eatest thereof thou shalt surely die,” because of the Book of Mormon teaching that Adam and Eve could not have children until they fell. People question, “Why would God give them conflicting commandments?” To critics this is seen as a fault in Mormon theology, and to Latter-day Saints it is often a source of confusion. Did a righteous God really coerce his children into becoming sinful? Why were Adam and Eve given seemingly no viable alternative to eating the fruit (and thereby becoming sinful)? Why would God seemingly give conflicting commandments to the Earth’s first inhabitants? In order to understand this issue, we must start at the beginning with the Character of God. God is all-wise, all powerful, and perfect in all his attributes. God is loving and kind, yet he hates sin. Sin is completely incompatible with his nature, “For I the Lord cannot look upon sin with the least degree of allowance,” and he is unable to tolerate it or perpetrate it since he is perfectly righteous. The Book of Mormon gives us much information about the laws of Justice and Mercy. These laws are eternal since they are God’s laws, and he is Eternal; he must abide by them. The law of Justice is actually God’s justice, or “the justice of God.” It is the result of God being perfectly just. If God was not perfect in all his attributes, he would “cease to be God.” This includes the attribute of justice. God is perfectly and inescapably just. This must always be the case; his justice must always be met, or he would not bear the rank of a God. The very fact that God is perfect requires that anything that is to share his glory must also be perfect. “And unto every kingdom is given a law; and unto every law there are certain bounds also and conditions. All beings who abide not in those conditions are not justified.” If a being does not abide the law of God’s presence, then God’s righteousness must require that that being be expelled from him. This is the principle on which Satan was cast out of heaven. 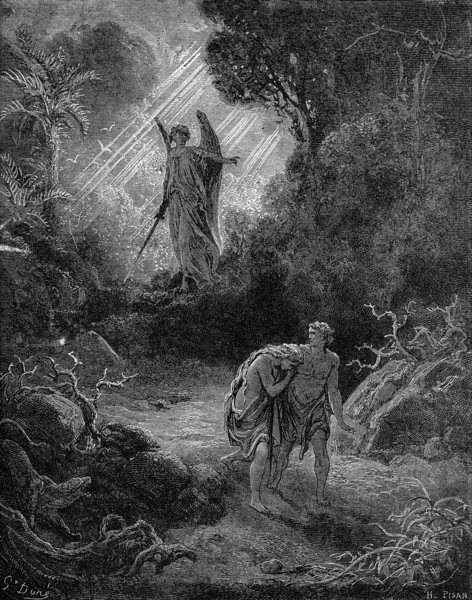 Apparently more is expected of spirits in their second estate than in their first estate, for there was a varying degree of righteousness among spirits who lived with God when Satan was cast out, yet those who did not falter sufficiently to lose their first estate were still allowed to stay in his presence. For some reason, God is able to be more lenient on spirits in their pre-mortal condition. However, more is required of those in their second estate and beyond. The principle of agency has been operative since the time man was organized into existence as spirits. Christ ascended to his position of eminence in the pre-mortal world through masterful usage of his own agency. All mankind is different from Jesus Christ and the Holy Ghost, though we are spirit brethren. That difference fundamentally lies in the fact that Christ (and the Holy Spirit, too) was able to attain Godhood while in the first estate, or pre-mortal existence. Christ was able to do this because of his supreme personal righteousness and zeal. In contrast, the rest of mankind was unable to attain Godhood in the pre-mortal life because of a lack of righteousness and zeal. This was why the plan of salvation was necessary in the first place. When the Father proposed the plan of salvation, all mankind was on a spiritual plateau, and had progressed as far as their intelligence would allow them to in the first estate. Mankind would have to enter their second estate to progress any farther. In order to progress in the second estate, it was necessary for mankind to fall, and to become carnal and lost. Then, by accessing the atonement, and by learning and growing through life, man embarks on a much longer path to perfection than Jesus tread. God referred to Jesus as “my beloved Son, in whom I am well pleased.” Why was Christ so well thought of? It was because he was good enough to attain Godhood while yet in the first estate. In contrast to Christ, the residue of mankind of a necessity had to receive a spiritual death, which in the perfect eyes of God is far from preferred. Hence we find what many feel to be the rebuke of God, which, if it is such, is only a formal one, given after the forbidden fruit was eaten. God could not fully condone this action in all his perfection, because it was transgression and resulted in spiritual death, a withdrawal from godliness. Indeed, it was “in the wisdom of him who knoweth all things,” and it was his merciful plan, yet it was not his preferred method of exalting his children. And to bring about his eternal purposes in the end of man, after he had created our first parents, and the beasts of the field and the fowls of the air, and in fine, all things which are created, it must needs be that there was an opposition; even the forbidden fruit in opposition to the tree of life; the one being sweet and the other bitter. Wherefore, the Lord God gave unto man that he should act for himself. Wherefore, man could not act for himself save it should be that he was enticed by the one or the other. And I, Lehi, according to the things which I have read, must needs suppose that an angel of God, according to that which is written, had fallen from heaven; wherefore, he became a devil, having sought that which was evil before God. And because he had fallen from heaven, and had become miserable forever, he sought also the misery of all mankind. Wherefore, he said unto Eve, yea, even that old serpent, who is the devil, who is the father of all lies, wherefore he said: Partake of the forbidden fruit, and ye shall not die, but ye shall be as God, knowing good and evil. And after Adam and Eve had partaken of the forbidden fruit they were driven out of the garden of Eden, to till the earth (2 Nephi 2:15-19, emphasis added). To summarize, the reason it appears that God gave Adam and Eve conflicting commandments is because God is too perfect to be “well pleased” with such a course as a fall of man. His spirit children are capable of progressing to Godhood while in the first estate, as has been proven in the case of Christ and the Holy Ghost. So anything less is not in sync with his ultimate perfection, and therefore falls short of his ultimate approval. Mankind did not progress to Godhood in the pre-earth life as did Christ. This was because of inadequate use of agency. In other words, the need for a “fallen state,” was man’s own doing, and man’s present condition is that “which man had brought upon himself because of his own disobedience,” in the pre-earth state. God said of the forbidden fruit, “thou shalt not eat of it,” in the same function as if he were giving the formal commandment, “be ye therefore perfect.” It is as if God were saying, “The perfection in me forbids that you fall and become sinful, because that would be transgression.” Yet it is God’s will for his children to progress, and a fall of mankind was the only alternative, so he created the conditions sufficient for the fall to happen. God did not put Adam and Eve in a position where they would have to partake of the forbidden fruit and become sinful. But rather, all mankind have put themselves in that position in the pre-mortal estate. The reason there are conflicting commandments is purely due to man's own inadequacy. So the fact that there were two commandments which could not both be kept was not God’s fault, but man’s. Bruce R. McConkie, Mormon Doctrine, 1979, p. 26. See also D&C 93:29-30. See Matt. 3:17, for instance. Alma 42:12. This scripture applies both to disobedience to the commandment, “thou shalt not eat of it,” (Gen. 2:17) and to disobedience or lack of zeal in the pre-mortal life, sufficient to become a God there.